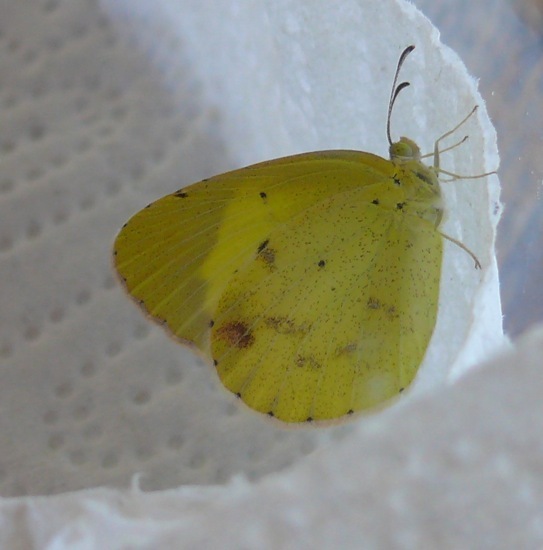 Little Yellows are fairly common our area of western Wisconsin during the summer. They probably migrate up each summer, and die when the weather gets cold in the fall. 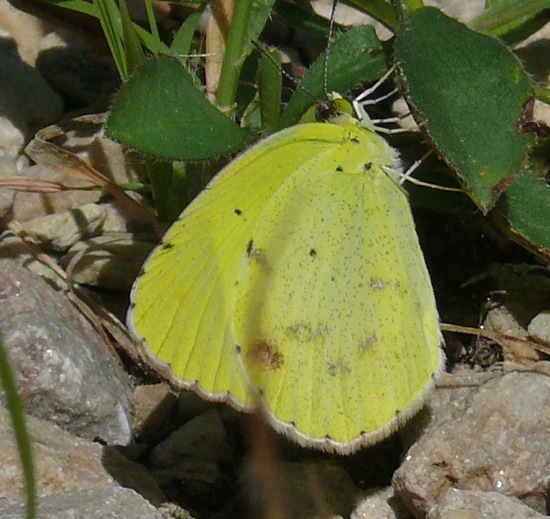 Here in Buffalo County, I usually start seeing them in mid-July. 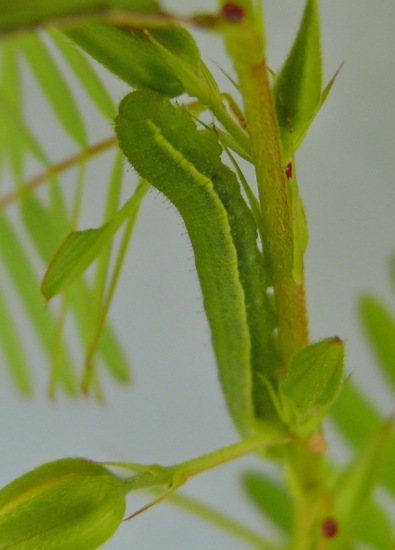 Little Yellows lay their eggs on Partridge Pea (Chamaecrista fasciculata) - a small native legume that grows in sandy, often disturbed places. Partridge Pea is native in western and southern Wisconsin, but here in Buffalo County it's not very common. I'm always amazed to see so many Little Yellows fluttering around our Partridge Pea - the plants on our land are the only Partridge Pea plants I know about anywhere near here. I wonder how the butterflies find them. 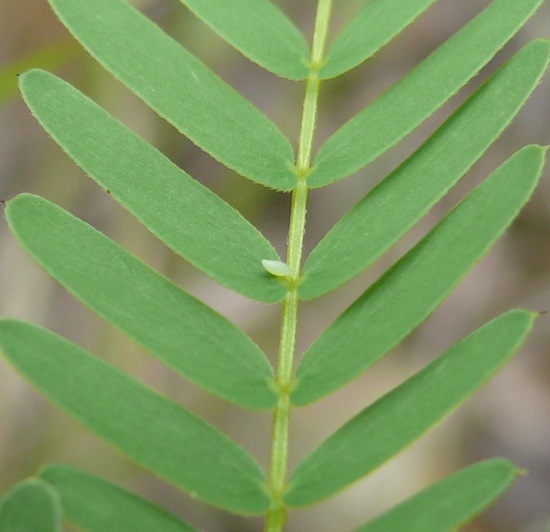 James Scott, in his book Butterflies of North America, also lists Amphicarpa as a host plant. Amphicarpa bracteata, Hog Peanut, is a common plant here - both in wetlands and open woods. I've seen a few Little Yellows along the edges of our wetland - it would be interesting to see if they lay eggs on Hog Peanut. That might explain how they find their way here. 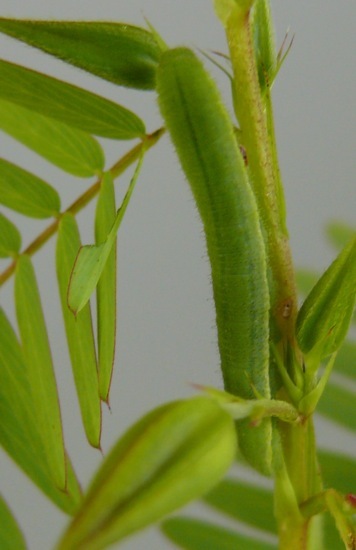 This is a Little Yellow egg on the petiole of a Partridge Pea leaf. 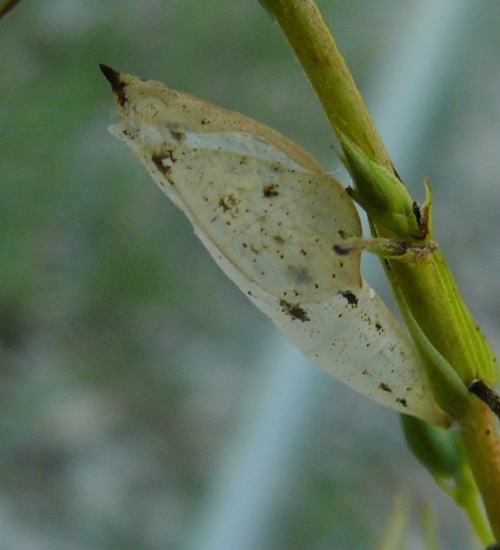 I've always found their eggs on top of the petiole, on a fairly young leaf. This one was laid on July 30, 2010. 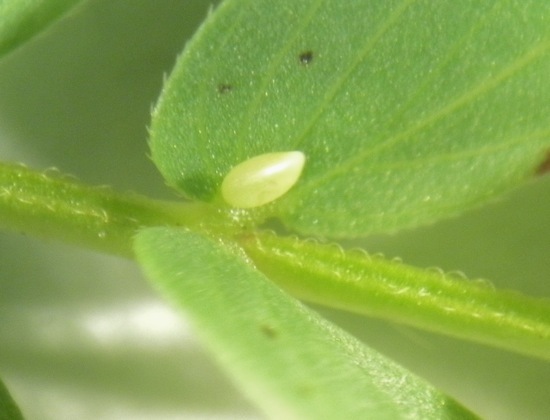 I think it took me a few days to notice that the egg had hatched - the eggs - and the caterpillars - are very small. 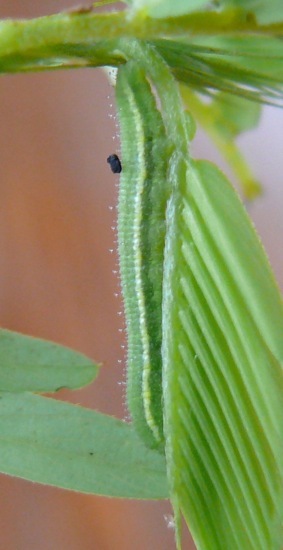 On August 2, the caterpillar was hanging along the petiole underneath a leaf. There's a piece of frass stuck to it, and drops of moisture on the hairs on its back. August 2, with a ruler - the caterpillar was 1/2 inch long. Then I found the empty chrysalis. This entry was posted on Thursday, September 23rd, 2010 at 3:47 pm	and is filed under Uncategorized. You can follow any responses to this entry through the RSS 2.0 feed. Both comments and pings are currently closed.